Seattle has over 90 unique neighborhoods. 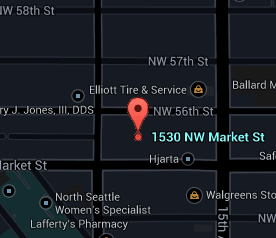 The location of Hjarta is in the area known as Ballard. Every building has its own personality and attributes. The community is an important aspect of city living and can have an impact on how integrated it is with the residences. The Hjarta building features can be explored here. A full list of amenities within the complex is displayed to help understand the offerings of the project. Hjarta, which is Swedish for "heart", is centrally located in the middle of one of Seattle's most in demand neighborhoods: Ballard. The building's name is not only an homage to the Scandinavian heritage prevalent in the neighborhood but also to it's excellent location, just steps away from Ballard Market. Hjarta's 89 condominiums range in size from 685 square feet to large homes totaling over 1,900 square feet in size. At the time of its completion, Hjarta was the first concrete and steel building outside of Seattle's Downtown core. It also earned the LEED Silver Certification not long after it was built. In addition to a variety of attractive floor plans, the residents can enjoy amenities: a club room and a fitness center with a yoga room. Add in the community rooftop deck with gardening patches and you are home! All active, contingent, pending, and sold listings for the Hjarta building. The Stroupe Group specializes in downtown Seattle condominiums. All the articles that have been published by the Stroupe Group concerning Hjarta and Ballard can be found here.